Galileo Galilei helped usher in the age of modern science with his revolutionary ideas and inventions. He's perhaps best known for his vast improvements to early telescopes, allowing him to study heavenly bodies in unprecedented detail. He also challenged common conceptions about our place in the cosmos. Before Galileo, philosophers and theologians widely believed that the Earth sat at the center of the universe, and they thought that the heavenly bodies revolved around our pale blue dot. Instead, Galileo, supported the idea that the earth and planets moved around a motionless sun — a belief pioneered by the Polish monk Copernicus. The idea initially drew condemnation from the Catholic Church, but eventually, Galileo's heliocentrism prevailed. At the time, many thought that a moving Earth contradicted common experience and, in the Church's opinion, "Holy Scripture." To demonstrate how a moving Earth could be consistent with our everyday experience, Galileo introduced a thought experiment in his 1632 book titled "Dialogues Concerning the Two Chief World Systems." This work proved effective at the time, and he even received approval to publish the book from the Pope. Although the "Galileo's Ship" thought experiment may seem obvious nowadays, this thought experiment helped blaze the trail for Einstein's mind-bending Special Relativity. Imagine Galileo (in finger puppet form) sitting in the hull of a windowless ship, unable to see outside into the sea. His ship speeds up until it's moving at a constant velocity; at this point, being in the ship's hull will feel as though the ship were at rest in a calm harbor. 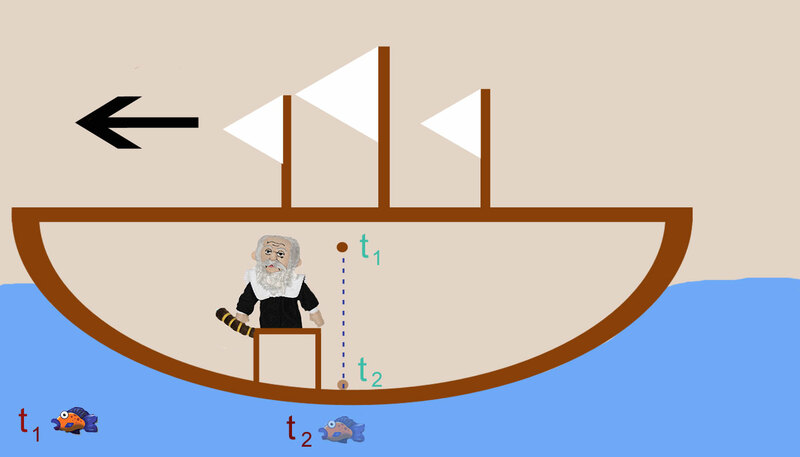 Galileo's ship is moving at a constant speed to the left. The fish remains stationary relative to the Earth. Galileo drops a ball at time t1 that hits the ground at time t2. The fish's position is displayed at both times. Click for a larger image. Galileo image courtesy the Unemployed Philosophers Guild. Upon reaching a constant velocity (toward the left in the image above), Galileo starts conducting simple mechanical experiments. For our example, let's imagine that he is simply dropping a ball from the top of the ship's cabin to the floor, noting where it lands. If the ship were stationary at the dock, the ball would drop straight to the floor directly beneath where Galileo were holding it. But what would happen if the ship were moving at a constant velocity? Galileo actually conducted a similar experiment and discovered that the ball would simply fall directly below where it's dropped, just as if the ship were stationary. From Galileo's point of view in the ship's hull, there was no difference between a ship with constant velocity and a stationary one. But differences arise when you consider other reference frames. In the drawing above, the front of the ship passes a stationary (relative to the Earth) fish at a specific time called t1. Seconds later at time t2, the ball hits the floor of the ship as the middle of the ship passes over the fish. From the fish's perspective, the ball not only dropped vertically but also moved horizontally several feet. Similarly, if Galileo had a porthole to look through, he would notice the fish moving relative to the ship. This means that there is no "absolute" velocity. Velocity measurements will differ depending upon the reference frame in which they are measured. For instance, Galileo's ball had no horizontal velocity from his reference frame in the windowless ship. The fish, however, would see the ball having a horizontal velocity equal to that of the entire ship floating overhead. Neither measurement is "correct." Quite simply, it's all relative. Galileo used this experiment to demonstrate that Earth could, in fact, move without conflicting with our everyday sense of the world. Even if the Earth were moving, everything on its surface would move at the same speed. Consequently, doing these experiments in the geocentric universe of the Church and the heliocentric universe Galileo had in mind would be indistinguishable. You will discover not the least change in all the effects named, nor could you tell from any of them whether the ship was moving or standing still. In other words, conducting mechanical experiments in two different reference frames that are moving at constant velocities relative to one another (such as Galileo's ship and the sea) will yield the same results. Galileo's thought experiment was one of the first expositions on "reference frames," although that term wasn't coined until the 19th century. Einstein refined Galileo's ideas with his theory of Special Relativity in the early 1900's, and you can learn more about the conflict between Galilean relativity and Einstein's relativity in the Stanford Encyclopedia of Philosophy. Galileo's simple thought (and real) experiments have guided scientific thought for centuries, and you too can test this out for yourself. Next time you're in a car, train, or airplane traveling at constant velocity, take notice. It should feel as though you're at rest. Assuming there's no potholes or turbulence to disrupt your ride and change your velocity, that is.